Welcome to the Lucky Cat Museum's brand new Maneki Mart Gift Shop. Here you will find Maneki Nekos and other cat collectibles. If you see something you like, please contact me, donaldmoon@aol.com. If I still have your item, I will put it on hold for you. I can take PayPal payments, money-orders, personal checks, or, perhaps, even a trade may be considered. Once I have received payment, I'll carefully wrap your item and get it mailed to you as quickly as possible. Please check out my eBay rating, under "donaldmoon", to verify that promise. Thanks! Note: I'll be adding new items periodically, so please check back for more Maneki Mart treasures. CAT TAILS OF RESCUE: All proceeds go to Home2Cats, Memphis. 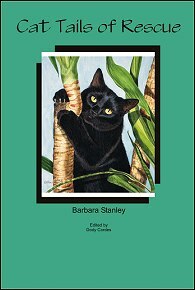 CAT TAILS OF RESCUE, by Barbara Stanley: 25 stories of some of the wonderful animals that have touched our lives at Home2Cats Rescue/Shelter in Memphis, TN. LAMA Books has donated the cost of publishing, so all proceeds will go directly to Home2Cats, a non-profit organization, to improve the lives of the animals and to educate the public. If you like animals, you'll like this book.